I have to head to town at some point this week to go to “wedding invitation street” by chowpatty. Would you be interested in seeing that? Obviously my immediate response was yes. Who could resist such an invitation (no pun intended)? My friend B is getting married in March back in the US but she is trying to coordinate her wedding planning from India (very brave indeed). One benefit of this is that everything here costs less. She first started finding planning a wedding in India enjoyable when she realized she could get the beading on her dress done here for thousands of dollars less. And so with invitations the idea was that the same concept might apply. She had already talked to a few vendors and was hopeful that the reduction in cost would outweigh the headache. So with all this in mind we set off to wedding invitation street- the hopeful bride-to-be looking to get her items made properly and the amused friend tagging along always looking for a hilarious Indian experience. 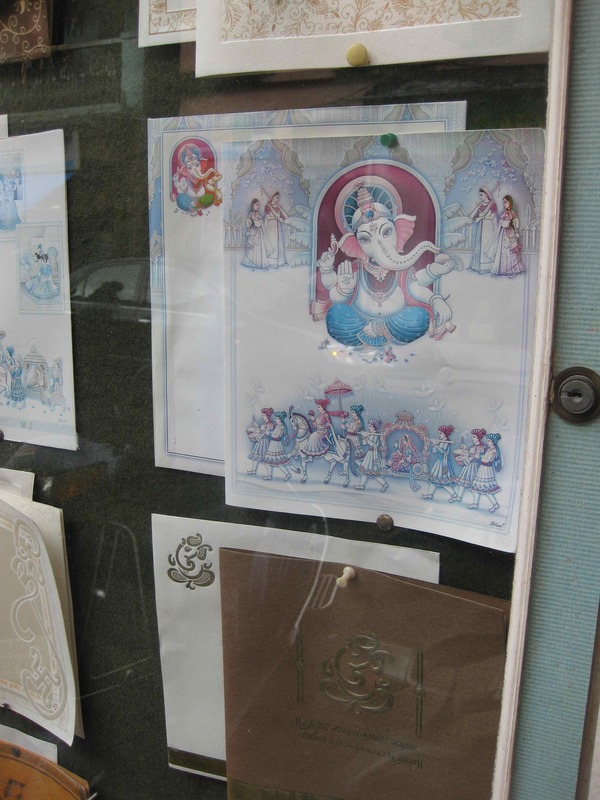 We arrived on the street and I was taken aback with how literal it was – actually every single shop on this entire lane in the middle of Bombay was devoted entirely to invitations. Professional looking shops with dozens of examples in the windows mingled with open-air rooms that barely boasted little more than a desk and some stools. Stacks of paper samples sat out in the humidity while store employees read newspapers or looked in a mirror while combing back their hair. I loved this part of India where people still had a craft. I love that here you can find a shoemaker and a tailor and a leather-worker all on the same row. Cheaper multi-purpose all-encompassing stores haven’t yet weeded out singular skills. I was a little bit enamored with this crazy street made just for the sole purpose of the unique art of invitations. It was hard to even know where to begin – there were so many stores to choose from and, after all, no store had Western examples in their windows. They were all populated with brightly colored and loudly designed rectangle shape invitations. Drawings of elephants or intricate motifs overtook even the most modest designs. We started with one vendor who B had spoken to earlier. But when we went in his store, of course, he wasn’t actually there. His employees dialed his number and he informed B that he would be in tomorrow. It didn’t seem odd to him that we had assumed he would be in his store on a Tuesday afternoon. Undaunted, we continued to a few other stores. “Hi, I’m hoping to do a Western-style invitation… do you speak English?” B would ask. We’d look at the shopkeepers to see if there was understanding beyond the immediate nodding. A few tried to help – but they didn’t have the right card stock or their examples didn’t inspire confidence. Finally one vendor (in an open-air store with just one desk and a small stool) sighed and pointed us towards a more professional looking place. We thanked him and decided to take his advice. We walked into the new store and were met with skeptical stares. After all, how many white people are looking to get invitations made here? But after it became apparent that they were familiar with Western-style invitations and that they had good card stock, we started negotiating. We would need invitations, RSVP cards, place-cards, the wedding program and a save the date. What kind of deal could he give us? It was hundreds upon hundreds of dollars less than even the cheapest place in the US. But, of course, B’s original vendor was cheaper. We’d have to come back another day. We’d met ‘wedding invitation street’ and we liked what we saw. But as with everything in India it might just take a little bit of time.